Discussion in 'Electric Instruments' started by andrew thomas, Feb 12, 2019. 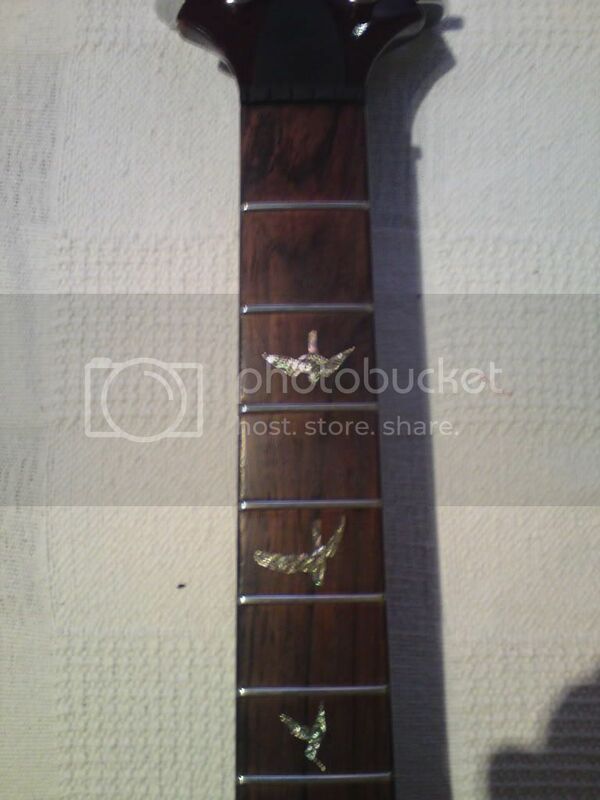 Does anybody have a guess on what wood this fretboard is? This is a 91 Custom 24 that I'm looking at purchasing. I called PRS customer service but they didn't have anything on record. Appreciate the help. Probably Brazilian. Respond to some other posts to get your post count up then you can post pics. Thank you! I was wondering why the images were not showing. '91 should be Brazilian. As for photos, you have to host them from a 3rd party photo sharing site like Imgur, or Flickr. Open grain on the surface. Yours isn't clearly one or the other. Darker/chocolate color. Again, on your potential guitar, not really obvious one way or the other. Florescence. A water extract from Non-Brazilian rosewood will fluoresce under a black light. BRW will not. The last tell is pretty conclusive but I don't think you are going to be able to do it. If you sand a little off and smell the saw dust it will have a slightly sweet chocolate like aroma. Non-BRW will not. Have you given it the sniff test? BRW often smells like cut grass. Lightly scratch a small spot with your nail and give it a shot. Not necessarily definitive, but it could be another shred of evidence. We need pics of the guitar too. According to the model history on PRS’ site, they phased out BRW in ‘90-91 on Core models. Could be either. I bought my ‘91 new, and wasn’t told which it was, not that I’d have cared much, since the guitar was so good compared to anything else I’d played at the time. But my sniff sense of it was that mine was IRW. I love the sniff test, but it's true. It smells sweet. If I had to bet right now, I'd guess East Indian Rosewood. First, I appreciate all the feedback and I put up a few more pics of the guitar on the link above, it's a beauty. I've got a late 90s CU24 but always wanted a Whale Blue one(I've got the dark cherry sunburst). The owner is asking $2300 and if it's Brazilian I'm ok with the price. Thoughts? Can't offer any additional help, but man, that's a sweet looking guitar! Gut feeling IRW but as others have said it's hard to tell from your pics. BRW went on to CITES 1991, at which point it stopped being used for 'core' guitars so some will be BRW, others IRW. The serial range for '91 is approx 10,100 to 12,600 so as a guess the more towards 12,000 the more likely it's IRW. Edit - based on the new photos below I'd say probably BRW. g.wizz and grausch like this. I clicked on the link nd I think that is Brazilian. Looks a lot like the Brazzy board on my Santana II in terms of shape and smoothness. Place the abbreviation "IMG" inside this: [ ], without the quotation marks. Then paste your Imgur URL copied Direct Link immediately after. Then place "/IMG" in the same square parentheses after the URL. The image will be viewable on this forum. I've changed my view and think it's probaby BRW based on the revised photos having just looked at my two PRS with BRW and a couple of non-PRS with IRW. But it's hard to be sure. It also looks like Brazilian to me. Don't know if my 1992 one was special ordered but looks to have Brazilian as well and some of the most colorful birds I have seen on those older Customs. Brazilian board on this one.